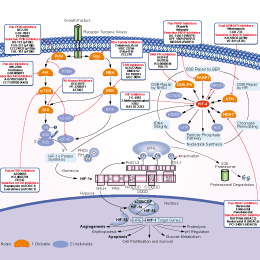 IDF-11774 is a hypoxia-inducible factor-1 (HIF-1) inhibitor. It reduces the HRE-luciferase activity of HIF-1α (IC50 = 3.65 μM) and blocks HIF-1α accumulation under hypoxia in HCT116 human colon cancer cells. Cells were plated at low density, treated with the indicated compounds and scored for resistance. Abbreviations: osimertinib (Osi), phenformin (Phen), metformin (Met), buformin (Buf), BAY 87-2243 (BAY), oligomycin (Oligo). KC7F2 is a selective HIF-1α transcription inhibitor with IC50 of 20 μM in a cell-based assay. Western blot analysis showed that KC7F2 (10 nM) significantly decreased the expression of HIF-1α, p27 and flt-1, while KC7F2 (10 nM) elevated cyclin D1 and flk-1 levels after 24 h incubation compared with the 1% O2 condition. YC-1 is an nitric oxide (NO)-independent activator of soluble guanylyl cyclase(sGC) and an inhibitor of Hypoxia-inducible factor-1alpha (HIF-1alpha). LW6 is a hypoxia-inducible factor 1(HIF) inhibitor which potently inhibits HIF-1α accumulation by degrading HIF-1α without affecting the HIF-1a mRNA levels during hypoxia. It inhibits hypoxia-induced HIF-1α transcription activity with IC50 of 2.64 μM in cell-based HRE-reporter gene assays. Canonical hedgehog transactivates HIF-1α, which mediates the angiogenic properties of HSCs. HSCs were treated with PX-478, cyclopamine or GANT-58 at indicated concentrations for 24 h (A-C） or 3 h (D). (A) Cell viability was determined using Cell Counting Kit-8. Data were expressed as percentage of control value (n = 6). *P < 0.05 versus control, non-parametric analyses with Kruskal-Wallis H test. (B, E) Real-time PCR analyses of angiogenic cytokines (B) and HIF-1α (E). Data were expressed as fold of control value (n = 6). *P < 0.05 versus control, non-parametric analyses with Kruskal-Wallis H test. (C, F) Western blot analyses of angiogenic cytokines (C) and HIF-1α (F) (n = 3). (D) Tubulogenesis assay with quantification of number of closed intercellular compartments (100× magnification) (n = 5). *P < 0.05 versus control, Student's t-test. Molidustat (BAY 85-3934) is a potent hypoxia-inducible factor prolyl hydroxylase (HIF-PH) inhibitor with IC50 of 480 nM, 280 nM, and 450 nM for PHD1, PHD2, and PHD, respectively. Phase 2. Western blot analysis of the indicated proteins after the treatment with BAY 85-394 (L). FG-2216 is a potent, and orally active HIF prolyl 4-hydroxylase inhibitor with IC50 of 3.9 μM for PHD2. Phase 2. Daprodustat (GSK1278863) is an orally administered hypoxia-inducible factor-prolyl hydroxylase (HIF-PH) inhibitor. Phase 2. MK-8617 is an orally active pan-inhibitor of Hypoxia-inducible factor prolyl hydroxylase 1−3 (HIF PHD1−3), inhibiting PHD1, 2, 3 with IC50s of 1.0, 1.0 and 14 nM, respectively.